Best bearing and wear nylon product available today. Proprietary type 6 nylon formulation produced using Mitsubishi Chemical Advanced Materials's Monocast® process. 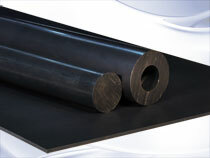 Solid lubricant additives impart self-lubricating, high pressure/velocity and superior wear resistance characteristics. Nylatron NSM PA6 was developed specifically for demanding applications where larger size parts are required. It is ideal for bearings, gears and wear pads. In wear applications, Nylatron NSM PA6 lasts up to 10 times longer than standard Type 6 nylon.